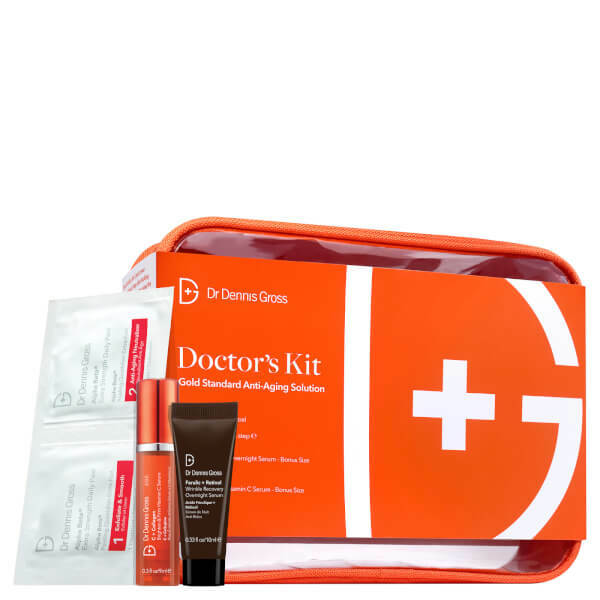 The Dr Dennis Gross Doctor's Kit combines everything you need to achieve smoother, radiant, younger-looking skin. Working in synergy, the patented two-step daily peel will gently exfoliate and nourish, whilst the serums firm and energise the look of skin. Each product will expertly tackle signs of ageing to promote a youthful-looking complexion. Free from parabens. Never tested on animals. Vegan. A daily, two-step anti-ageing face peel that helps to combat three signs of ageing: uneven tone and texture, fine lines and wrinkles, and enlarged pores. A stronger version of the original Daily Peel (that Dr Dennis Gross uses with patients at his NYC practice), the patented, extra strength formula contains seven acids to inspire a smoother, radiant-looking complexion. Easy and safe to use, Step One is infused with gentle, exfoliating acids to help slough away dead skin cells and dulling surface debris, whilst Step Two controls Alpha Hydroxy Acid activity and delivers anti-ageing actives. It will nourish skin and leave it feeling balanced, smooth and glowing. The complexion is perfectly prepped for the next steps in your skincare routine. Pores and wrinkles appear refined and reduced, and skin has a more even tone and softer texture. Free from phthalates. A weightless gel-serum that targets visible signs of ageing to leave the complexion looking smooth and glowing. Melting quickly into skin, the lightweight formula combines the brand's proprietary Vitamin C 3-O C Technology with Collagen Amino Acids and an Energy Complex to instantly brighten and smoothen the appearance of skin. It helps to improve the look of wrinkles whilst alleviating dark spots to promote a more even skin tone. After use, the complexion looks brighter and energised with improved firmness, radiance and texture. A potent formula that works while skin is most receptive to repair. Effortlessly smoothing over skin, the anti-ageing serum helps to recover the look of firm and youthful skin whilst you sleep. The effective serum is enriched with a time-released dose of Retinol, which supports skin’s natural repair process. Its blend of Retinol, Ferulic Acid and Niacinamide visibly re-texturises the complexion in order to smooth the appearance of fine lines and wrinkles, whilst evening the look of skin tone. Expect to awake to a refreshed and rejuvenated visage that is healthy and youthful. Daily Peel: For optimal results, use daily AM or PM. First time peel users may apply every other day until skin becomes acclimated. Massage Step 1 onto clean, dry skin until pad is dry. Wait two minutes. Repeat with Step 2. 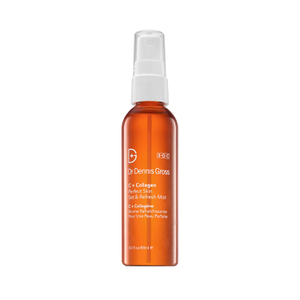 To further enhance results, follow with a serum and moisturiser of your choice from Dr. Dennis Gross Skincare™. Collagen Serum: Massage 1-2 pumps into clean, dry face, neck, and décolleté once daily. Follow with a moisturiser of your choice from Dr. Dennis Gross Skincare™. Night Serum: Nightly, massage 2-3 pumps into clean, dry skin. Follow with any moisturiser of your choice from Dr. Dennis Gross Skincare™. Use sunscreen during the day. Daily Peel: (Step 1) Water, Alcohol Denat. (SD Alcohol 40-B), Glycolic Acid, Potassium Hydroxide, Hamamelis Virginiana (Witch Hazel) Water, Salicylic Acid, Polysorbate 20, Lactic Acid, Mandelic Acid, Malic Acid, Citric Acid, Salix Alba (Willow) Bark Extract, Menthone Glycerin Acetal, Camellia Sinensis Leaf Extract, Achillea Millefolium Extract, Anthemis Nobilis (Chamomile) Flower Extract, Soy Isoflavones, Copper PCA, Zinc PCA, Lecithin, Disodium EDTA, Alcohol, Polysorbate 80, Fragrance (Parfum), Linalool, Benzyl Salicylate, Benzoic Acid, Phenoxyethanol, Sodium Benzoate. (Step 2) Water, Sodium Bicarbonate, Resveratrol, Retinol, Ascorbic Acid, Ubiquinone, Ascorbyl Palmitate, Phospholipids, Retinyl Palmitate, Tocopheryl Acetate, Soy Isoflavones, Achillea Millefolium Extract , Camellia Sinensis Leaf Extract, Raphanus Sativus (Radish) Root Extract, Copper PCA, Sodium PCA, Zinc PCA, Lecithin, Polysorbate 20, Polysorbate 80, Alcohol, BHT, Octoxynol-9, Simethicone, Tetrasodium EDTA, Sodium Benzoate, Phenoxyethanol..
Collagen Serum: Water, Glycerin, 3-O-Ethyl Ascorbic Acid, Niacinamide, Glycereth-7 Triacetate, Lactic Acid, SD Alcohol 40-B, Hydroxyethylcellulose, Dimethyl Isosorbide, Ascorbic Acid, Collagen Amino Acids, Superoxide Dismutase, Glycine, Carnitine HCl, Ubiquinone, Hexylresorcinol, Emblica Officinalis Fruit Extract, Hydrolyzed Soy Protein, Tetrahexyldecyl Ascorbate, Isoquercetin, Mandelic Acid, Pueraria Lobata Root Extract, Curcuma Longa (Turmeric) Root Extract, Phytic Acid, Citric Acid, Tetrasodium EDTA, Sodium Citrate, Butylene Glycol, Xanthan Gum, Polysorbate 20, T-Butyl Alcohol, Sodium Hydroxide, Polysorbate 80, Denatonium Benzoate, Benzyl Alcohol, Phenoxyethanol, Sodium Benzoate, Potassium Sorbate, Natural Colorant. Night Serum: Water, DiCaprylyl Carbonate, Niacinamide, Cetyl Alcohol, Propanediol, Isostearyl Alcohol, Jojoba Esters, Retinol, Ferulic Acid, Collagen Amino Acids, Sodium Hyaluronate, Hexylresorcinol, Ellagic Acid, Gallic Acid, Silybum Marianum Ethyl Ester, Tocopherol, Phospholipids, Camellia Sinensis Leaf Extract, Linoleic Acid, Linolenic Acid, Mandelic Acid, Lactic Acid, Sodium PCA, Retinyl Palmitate/Carrot Polypeptide, Retinyl Palmitate, Glycerin, Evodia Rutaecarpa Fruit Extract, Helianthus Annuus (Sunflower) Seed Wax, Acacia Decurrens Flower Wax, Glycine Soja (Soybean) Oil, Caprylic/Capric Triglyceride, Polyglycerin-3, Tricaprylin, Acrylates/Carbamate Copolymer, Butylene Glycol, BHT, Butylene Glycol Cocoate, Acrylates/C10-30 Alkyl Acrylate Crosspolymer, Polymethyl Methacrylate, Xanthan Gum, Ethylcellulose, Disodium EDTA, Sodium Hydroxide, Citrus Aurantium Bergamia (Bergamot) Fruit Extract, Citrus Limon (Lemon) Peel Extract, Lavandula Angustifolia (Lavender) Flower/Leaf/Stem Extract, Octoxynol-9, Phenoxyethanol.